IT WAS the biggest day of the year for film buffs. Boxing Day has traditionally seen one or two Hollywood blockbusters released to holiday audiences eager for summer movies. But yesterday saw thousands queue for tickets for three new releases - Wreck It Ralph, Les Miserables, and The Hobbit: Unexpected Adventures. 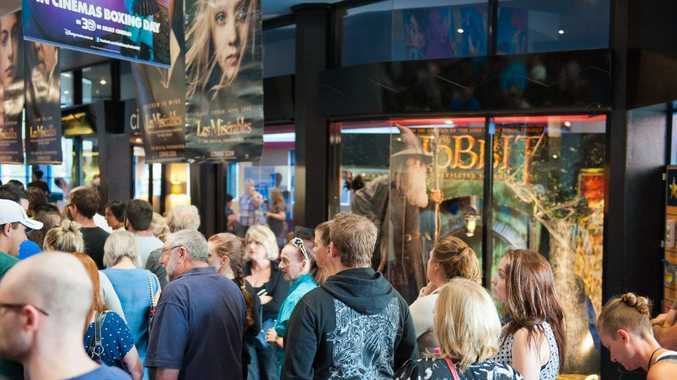 Peter Jackson's hotly anticipated film The Hobbit - the first of three prequels to smash hit film franchise Lord of the Rings - was a popular choice at Coffs Harbour's Birch Carroll and Coyle Cinemas yesterday. "When we opened in the morning, we'd already sold 900 tickets," Birch Carroll and Coyle Cinema Manager Sue Amos said. Over the course of the day, all sessions of The Hobbit: 3D sold out completely, with ticket sales for the cinemas' other films, particular Oscar-award contender Les Miserable, going close to selling out. "That's about 5000 tickets in total," Sue said. The line to get into the cinema stretched out through the packed foyer and out onto the terrace; cinema manager Sue was out on the floor attempting to get the cheerful, messy crowd into ordered queues. "It's the best Boxing Day we've had in years," she said. Check out our review of The Hobbit: An Unexpected Journey.